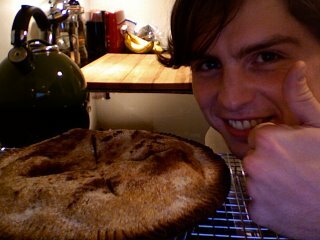 Nothing in the House: Erik's First Pie! It took me all evening, but I did it. I baked an apple pie! Check it out! That dark stuff is just cinnamon. It sort of clumped up on me when I wanted to sprinkle. It dropped instead of sprinkled.